When Jordan Spieth slipped on his green jacket after a dominant performance at the Masters in 2015, the 21-year-old did more than become one of the youngest players ever to win at Augusta National. He also became the first player in nearly four decades to lead wire-to-wire all by himself. By owning the lead after the first round and never letting go, Spieth matched the feat previously accomplished by Raymond Floyd in 1976. A few other Masters champions have survived all four rounds with at least a share of the lead, most recently Trevor Immelman in 2008. But the rarity of start-to-finish winners at Augusta is evidence of the long, difficult road even first-round leaders face. And yet a strong start is often a confidence boost at the Masters, where local knowledge is crucial in the only major played on the same golf course every year. So, if you’re betting the Masters and looking at the first-round leader, here are a few things you need to know. When it comes to golf betting, backing a first-round leader to win takes — well, courage may not be the exact word, but it’s close. Over the last two decades, Spieth in 2015 and Immelman in 2008 were the only winners to own all or part of the lead after the opening round. In addition to Spieth and Floyd, just three others have led all the way by themselves: Jack Nicklaus in 1972, Arnold Palmer in 1960, and Craig Wood in 1941. Chris DiMarco and Chad Campbell led after the first rounds in 2015 and 2010, respectively, and then lost in playoffs to Tiger Woods and Angel Cabrera. 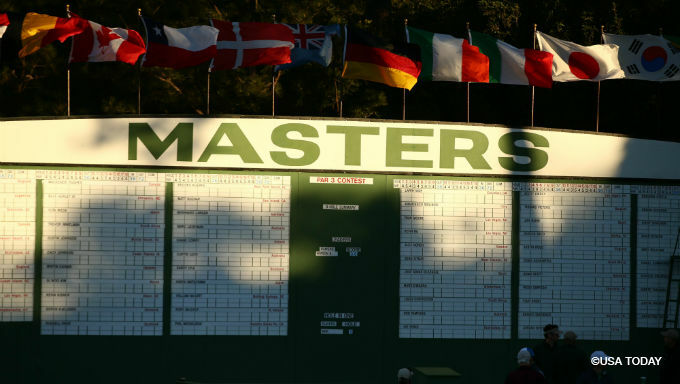 Three other Masters winners of the past 20 years have lingered one shot off the lead after their respective opening rounds: Bubba Watson in 2014, Phil Mickelson in 2010, and Jose Maria Olazabal in 1999. So, maybe that to-win bet isn’t the most advisable. But if you’re mulling an each-way bet following the opening round, consider this: nine times over the past 20 years, a first-round winner has gone on to finish in the top five, nearly a 50-50 proposition. And no first-round leader in the past two decades has missed the cut, if that prop bet is available. Some first-round leaders fall apart, but that’s rarer than you think. Over the last 20 years, just five have wound up outside the top 20, most recently Charley Hoffman in 2017. Half the first-round leaders of the last two decades have finished within five strokes of the lead. So, maybe most Masters champions don’t hold the first-round lead. That’s sound golf betting strategy to keep in mind. However, most of them have been near the top after the opening 18 holes. Comebacks like Woods’ rally from seven strokes back after the first round in 2005 remain rare, even on a very accessible golf course like Augusta. From 1999-2018, the average stroke deficit by eventual champions after the opening round is 3.05. Patrick Reed trailed by three after the first round in 2018, Danny Willett by four in 2016, Adam Scott by three in 2013, Watson by two in 2011 and Cabrera by three in 2009. If you’re looking for a potential winner, he might be hiding in that range of third to fourth after the first round. Woods’ comeback in 2005 was epic, requiring a 66 and 65 to pull him into contention after his slow start, and saw his fourth green jacket secured in a playoff victory over DiMarco. It was one of four times that decade that the eventual winner rallied from five shots or more behind after the first 18 holes. That includes Garcia in 2007, who opened six shots behind Hoffman, and Mickelson in 2004, who entered the second round five behind Justin Rose. Woods has twice rallied after poor first rounds, surging from five behind DiMarco (again) in 2001. Those are pretty illustrious names, emphasizing that big comebacks after the first round don’t happen very often, and it takes special players to pull them off. Hoffman was a 125/1 (126.00) long shot to win the Masters before he teed off in 2017. After he completed his opening round with a four-shot lead on the field, his odds to win shrank to 13/2 (7.50). Such swings aren’t unusual after the first 18 holes. Lee Westwood opened at 20/1 (21.00) to win in 2012, and improved to 4/1 (5.00) after taking a one-shot lead after the first round in 2012. Two years later, Bill Haas surged from 80/1 (81.00) to 15/1 (16.00) after grabbing the first-round lead. Spieth dropped from 10/1 (11.00) to 9/4 (3.25) after the first round in his 2015 victory, McIlroy from 25/1 (26.00) to 5/1 (6.00) after seizing early control in 2011. Such swings toward less favorable odds might encourage bettors to look a tad deeper into the field, where the real value can be found — like Garcia at 15/1 (16.00) after the opening round in 2017, Danny Willett at 30/1 (31.00) in 2016, and Reed at 20/1 (21.00) after his first 18 holes in 2018. Because those first-round leaders rarely stay on top until the end — at Augusta, it’s a tradition unlike any other.